Wonderful people!! Everyone is so friendly and caring and helpful!! I HIGHLY recommend this office to anyone who has a fearof dentists because they truly care about you!!! Wonderful people!! Everyone is so friendly and caring and helpful!! I HIGHLY recommend this office to anyone who has a fear of dentists because they truly care about you!!! 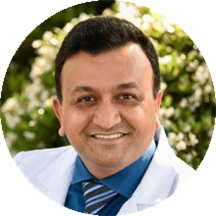 Dr. Patel graduated from one of the best dental schools in India and after practicing over a year in India, he and his wife moved to USA. He passed his National Board Exam and California Board Exam in the year of 2002. Always thirsting for knowledge, Dr. Patel keeps up-to-date with the latest advancements in dentistry, radiology, and sterilization. He has always gone beyond what is expected to offer only the best to his patients. Dr. Patel’s approach to your treatment always starts with patiently listening to you. Then, after a complete and through examination, he reviews and discusses the diagnosis and treatment options with you. He is honest with his patients, and he always give time to his patients to ask questions and give straight-forward answers. He is proud to provide his patients with the best in dental technology, treatment options and patient comfort. It is his pleasure to address all your questions and concerns. He enjoys the outdoor and likes to travel. He likes to spend time with his wife and twin sons. AS usual....excellent service with kindness and care!!!! For any one needing or desiring a new dentist I personally recommend Dr. Patel. Latest equipment and new facilities..........In about 2&1/2 hours, one visit, I received a new crownon one of my teeth and that quick service /////// Try it you'll like it ?